Classic colours and takes good care of my mouser and beard. As a teenage boy, you took great pleasure in seeing a girl searching high and low for her hair comb, wondering what all the fuss was about. It’s not until your start growing a beard and level-up to the point where you need a beard comb that you start understanding their pain. 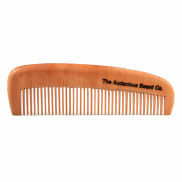 Combing your beard becomes a daily habit once you’ve got your very own dedicated beard comb. The feeling of leaving the house without combing your beard is awkward. You don’t feel complete. Scroll all the way down for some awesome tips about combing your beard the right way. Thereâs nothing complicated about the goal of having a beard. You want your beard to look manly, organised and worthy of receiving comments from both those who are and those who arenât graced with a beard. With the best beard comb, your friends wonât be able to help themselves but give your beard the praise it deserves. Beards have been celebrated throughout the centuries, with the beard becoming a part of the identity of famous figures. If you were to draw a picture of Abraham Lincoln, Mr. T, Gandalf, Leonardo da Vinci, Santa Claus or Hulk Hogan, their beard (well, moustache in the case of Hulk) would be one of the most defining characteristics. Do you want your beard to be a part of your identity? Split ends arenât just for the hair on your head. Again, youâll have heard the girls cutting their split ends to get the healthiest hair in school. When it comes to beards, split ends occur and trimming is often required. A poor-quality comb is going to damage the follicles of your beard, resulting in more split ends, more trimming, and a smaller beard. We canât have that now, can we? A comb helps train your beard. Yup, your beard can learn a thing or two from you. By regularly combing, youâll be able to cut the longer hairs away. Over time, your beard will learn to grow down. Ingrown hairs are never fun. They arenât fun wherever they are, including your beard. As your beard hair learns to grow down from consistent combing, the risk of painful ingrown beard hairs is reduced. 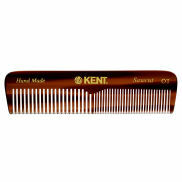 People have been buying quality combs such as Kent combs for centuries and they continue to improve their product, whereas buying a comb from your local Poundland may do more harm than good. When they're stamped out of a mould, there are hundreds of microscopic edges on the teeth ready to damage your beard hair. Get yourself a nice wooden beard comb instead. They're better and last a long time. The concept of brushing a beard is simple. Unfortunately, there's a wrong and right way to comb your beard. Take these tips on board to ensure you arenât doing more harm than good with your beard comb. Do not comb a wet beard. When you comb after showering, you're exposing your beard to hair loss. For beards of less density, this could lead to an even less dense and more scraggly beard. The best time to comb is after moisturising. After you have moisturised your beard with an oil and/or balm is the easiest. Your beard will have more weight to it, allowing the comb to slide through any knots that have appeared. Choose the right comb. Beard hair differs in thickness. The thicker your beard, the larger the gap required between the teeth. Always start brushing with the widest gap in the teeth on your comb and progress to the finer teeth. Be gentle with the combing. Aggressive combing can break the hairs of any knots found in your beard. With gentle combing, you can untangle knots as you find them. Where to buy the best beard comb in the UK? Right here, of course. We sell high-quality beard combs youâll be pleased to add to your grooming arsenal. The beard and moustache combs we have will increase the number of comments you attract.